Any flaws can be seen in the term 30 weeks? In physiological pregnancy, one of the screening ultrasound is carried out in a period of 30-32 weeks. The ultrasound procedure this term is slightly different from the previous one. First, you can see over the formed organs of the fetus and to evaluate them; secondly, there is additional study of the blood vessels in the circulatory system between the fetus and the uterus of a pregnant woman. What interests the doctor at the ULTRASOUND examination at term 32-34 weeks? The presence or absence of entanglement of umbilical cord. The development of the internal organs of the child, their compliance with gestational age. The condition of the placenta – one of the key points of the survey at 30-32 weeks. Evaluation of amniotic fluid (low — or polyhydramnios). The condition of the uterus, of the cervix. Multiple pregnancy compare the amount of kids. Ultrasound in 32-34 weeks is the final screening study before birth. Thanks to data obtained by ultrasound, the gynecologist decides how it will be made the delivery. From 30 to 41 weeks of pregnancy the fetus continues to move and can take any position in the uterus. If by 34 weeks, the fetus is turned head down, can a decision be made about the external rotation of the fetus. Sometimes the active movements of the baby may occur suffocation by an umbilical cord. The ultrasound clearly be seen. The entanglement can be of different tension, single or multiple. It happens that wrapped the umbilical cord of the nodes appear. At term 32-34 weeks it’s important to know the right tactics of childbirth. Knowing that the neck of the fetus surrounded by a dense cord of the umbilical cord, the obstetrician will be ready to release the head and neck from the umbilical cord immediately after the birth. This is to avoid hypoxia during labour and the effects it causes. READ MRI of the kidney: what the survey shows? First the doctor draws attention to a previous survey, comparing them with the present in the dynamics. If the position of the fetus allows, assess the person of the fetus for the presence (absence) of a gap between the nose and lip. If the baby is turned so that the face is not visible, it is based on the previous survey. Measured value of the ventricles of the brain to exclude hydrocephalus. Assess the condition of the heart – the number of cameras, the availability of the necessary holes. Also pay attention to the gastrointestinal tract – the proper placement of structures, the presence of cavities in the stomach and intestines, this prevents hernia and atresia. In mandatory fetometry, i.e., the dimension of body parts of the fetus. Since the last time the fetus is actively growing and gaining weight, the indicators 32 and 34 weeks from the same fetus can vary greatly. Determine the estimated weight of the fetus. Children who weigh less than normal are the study of the causes of the shortage of body weight. Sometimes this is due to the Constitution of the pregnant woman, then everything is normal. But sometimes low weight means the presence of pathology. If the size of the fetus more than the norm, it is possible about a delivery by caesarean section. The average weight of the fetus at 32 weeks is 1850 grams, at 34 weeks ranging from 2300 g to 2400 g.
One of the most important organs, which are examined in the third screening in the placenta. First of all look at the exact location of the placenta. It is necessary to know for caesarean section. Ultrasound also shows how close the placenta is to the cervix and its fix. If it is too close to her location will probably be the question of operational delivery. READ MRI coccyx: preparation, conduct that shows? The second important point of the study of the placenta at 30 to 34 weeks is the definition of maturity. There are several levels of maturity (0, I,II,III). As its development (aging) placenta becomes lobed structure. In the early stages of development, the placenta should not have lobes at all, and II the degree of maturity appears after 34 weeks. Full lobed structure should be formed after 36 weeks of pregnancy. To identify the degree of maturity of the placenta is important for the diagnosis of early skin aging. It is essential that the placenta and the fetus developed in parallel. Because when ahead in the development of the placenta leads to fetal problems. The amount of amniotic fluid depends on the health of the placenta. If the placenta does not have time to cope with their tasks, it produces a small amount of amniotic fluid. This leads to a small selection of fluid by the fetus through the urinary system. In General is the lack of water. Such a violation requires immediate hospitalization and appropriate therapy, followed by ultrasound. Polyhydramnios is largely due to violations in the body of a pregnant woman. Most often mnogoboryu leads to diabetes, infection, rhesus incompatibility, etc. Systolo-diastolic ratio (SDO) in the arteries of the umbilical cord in term 3 from 2.88 to 2.52. The resistance index (IR) of umbilical cord artery 30 through 34 week varies from 0,52 to 0,72. Pulsational index in uterine arteries from 0.4 to 0.65. Significant decreases may indicate preeclampsia in pregnant women and fetal hypoxia. 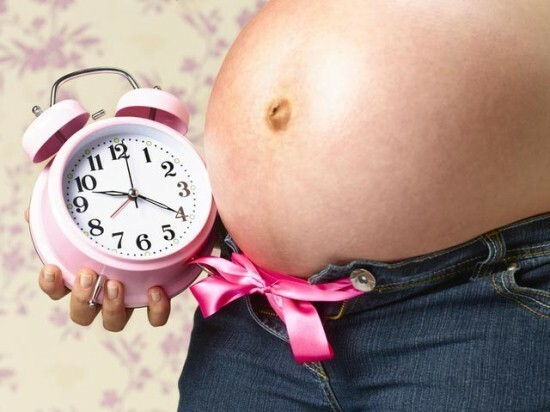 The first pregnancy is not uncommon overdue. Usually doctors monitor the situation and allow you to perenashivanie more than 41 weeks. After 42 weeks, the fetus is considered term and it’s also not good, as premature pregnancy. If the birth did not come until 41 weeks then childbirth should be encouraged or permitted to be made by caesarean section. This problem solved after the big ultrasound. At 41 weeks the fetus is large enough. Growth is not less than 50 cm, and the weight average 3200 g. All systems and organs of the child in 41 weeks fully ready for independent work, that is why the child is considered full-term. 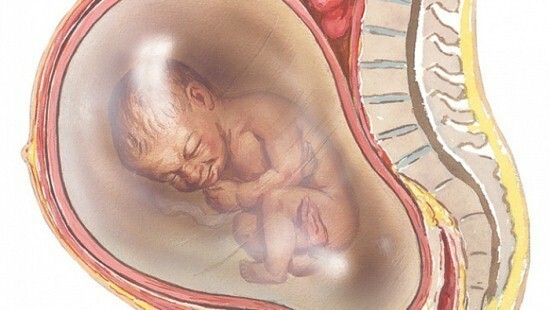 And being in the womb, more than 41 weeks will bring harm to the baby because the placenta can no longer do their job. An ultrasound at 41 weeks of pregnancy does not harm child’s health, but rather helps to determine the best option of birth. So do not be afraid of this study. If you compare with any other instrumental method, the degree of harm from ultrasound minimum and no matter what time it is conducted in 12 weeks or 41. The information obtained on ultrasound in the later stages, help doctors to form correctly the tactics of delivery. That will allow mom and baby to stay healthy. At what period of pregnancy see twins on the ultrasound?